And so begins the Christmas countdown….with cookies, of course! I’ve been sitting on this recipe for about a month now dying to share them here with you guys but waiting for all the Thanksgiving madness to pass. November was a busy month for Mike & I. There’s been traveling, site seeing, catching up with old friends and spending questionable amounts of time in grocery stores admiring the sheer amount of gluten free options y’all have here. I can’t even tell you how jealous I am of the fact that you can buy tapioca flour in an actual store and not online….Sprouts, you will be sorely missed. 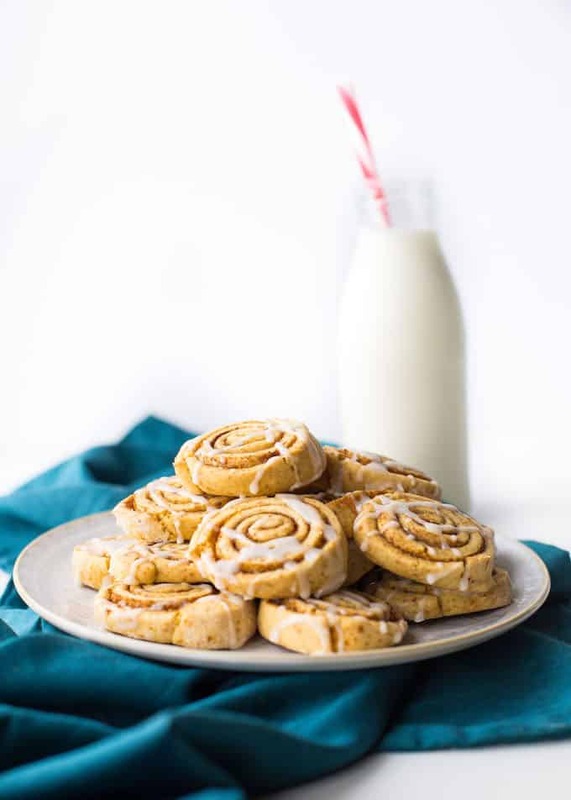 Now that we’re safely on this side of Thanksgiving I’m ready to get my Christmas baking on with these cinnamon roll cookies! ✔️Refined sugar free – Even the glaze can be made refined sugar free. ✔️Vegan – Again, thank you chickpea flour for being so sticky & binding! They taste like actual cinnamon rolls without all the hassle….So let’s get to it! These cookies are a lot easier to make than they might look. You start mixing together your base flours: tapioca & chickpea flour along with the baking soda to combine. Once fully whisked together mix in the remaining cookie ingredients. I recommend using an electric handheld or stand mixer here. Chickpea flour can be pretty thick and sticky when wet which can be tricky to mix by hand. Once the dough is all mixed together it’s time to roll out the dough. Roll it out into a large rectangle, about 9×7 inches long. Brush the top of the dough with a little melted coconut oil and then sprinkle over your cinnamon sugar mixture as evenly as you can. Carefully roll up the dough into a log like the one showed above and place in the fridge to harden up for about in hour. I don’t recommend skipping the fridge time here. 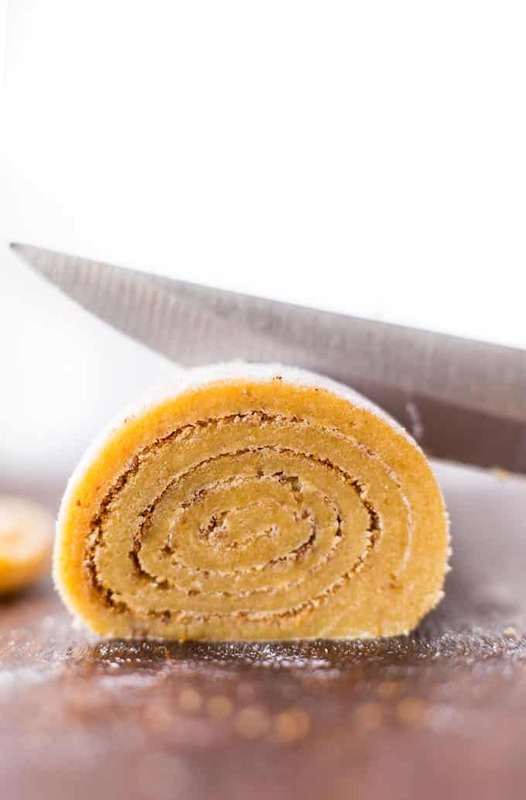 The dough logs need time to harden up in the fridge before you slice in bake otherwise your cookies will be more cinnamon lump rather than cinnamon roll. Still tasty, just not as pretty. After baking you can whip up a quick glaze to top off your cinnamon roll cookies. I’m personally never one to skip a glaze, but this part is up to you. I left a few unglazed for Mike & they were still plenty delicious. If you want to keep these cookies fully refined sugar free than you can make your own powdered coconut sugar pretty easily by blitzing coconut sugar in a blender until soft & powdery. Once your cookies have baked & cooled simply drizzle your glaze over the top (or don’t) and enjoy! 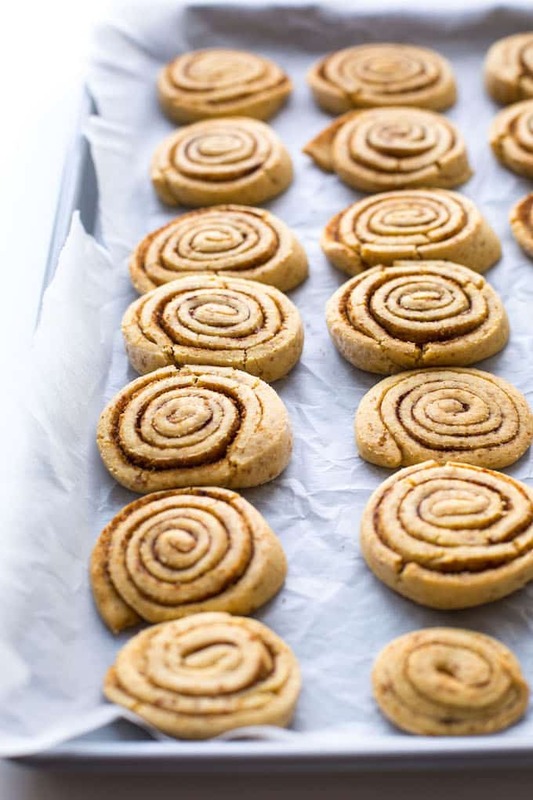 If you liked these grain free cinnamon roll cookies then you might also like my grain free peanut butter blossoms(also made with chickpea flour), peppermint mocha brownies cookies, and cardamon ginger cookies. I have a feeling these cookies are gonna be a year round staple in our house. 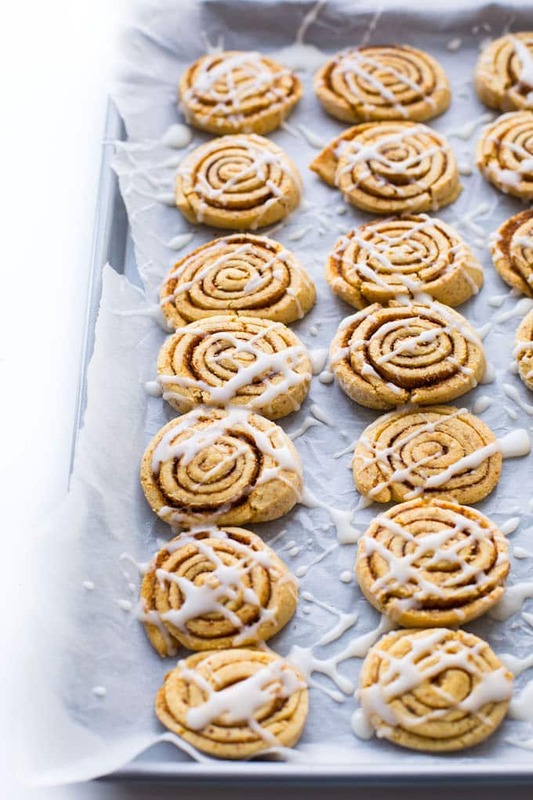 Don’t forget to #asaucykitchen on instagram if you try this Cinnamon Roll Cookies! We love seeing what you make! You can also post your pictures to my facebook page! In a large bowl whisk together the chickpea flour, tapioca and baking soda until combined. Stir in the the coconut oil, vanilla extract, maple syrup and coconut sugar until everything is fully mixed together and a dough forms. Lightly flour a large sheet of baking parchment (or silicon mat). Form the dough into a ball and then roll around in the floured surface. Chickpea flour is sticky so doing this will make it easier to roll out. Roll out the dough into a large rectangle - about 9x7 inches and 1/4 inch thick. Use a pastry brush to spread the melted coconut oil over the top of the dough. In a small bowl whisk together the sugar and cinnamon together and then scatter the mixture over the top of the dough, evenly. Carefully roll the dough up to form a 9 inch log. Wrap up your log in plastic wrap and place in the fridge for an hour to firm up before slicing. Preheat the oven to 350°F/175°C. Lightly line or grease a large cookie sheet. Set aside. When you're ready to bake take the log out of the fridge and cut into 1/4 - 1/2 inch slices. Place the slices on your prepared cookies sheet - leave an inch between each piece because they will puff up slightly while baking. Bake in the oven 8-10 minutes or until lightly browned on the sides. Let cool on the cookies sheets for about 5 minutes before transferring to wire rack to cool completely. To make the icing: whisk the ingredients together in a small bowl until no lumps remain. If the icing is too fluid add more sugar. If it's too thick add a tiny bit more milk. When the cookies are completely cool drizzle over the top and enjoy! You can make coconut sugar powdered sugar with a high powered blender simply by blitzing it in the blender until it forms a powder. Chickpea flour can also be called gram flour, garbanzo flour and/or besan flour so just keep that in mind when shopping for flours. I've had varying success using cornflour/starch instead of tapioca flour. If you want to use cornflour you'll need to add an extra 1-2 tablespoons coconut oil because it does make the dough drier. I have not tested this recipe using a substitute for chickpea flour so I can't offer any advice using a different flour there. That makes me soo happy to hear! I’m really glad you enjoyed them – thank you so much for taking the time to come back and let me know what you thought! I LOVED THESE! They look so cute and the texture is so moreish. You really gotta have some self control after these come out the oven! I agree – I love these! Thanks Sally! 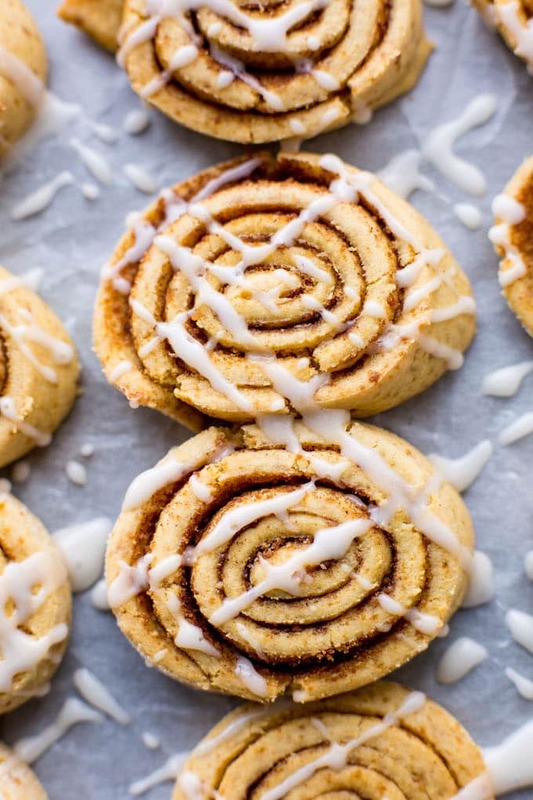 I love how much these look like cinnamon rolls – with the glaze and everything! I’m all about hassle-free baking so I’m excited to give these a try! Thanks Charlotte! Hope you like them!